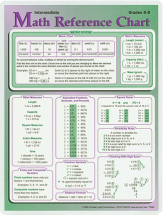 This durable, two-sided sheet follows the Elementary Math Reference Chart. 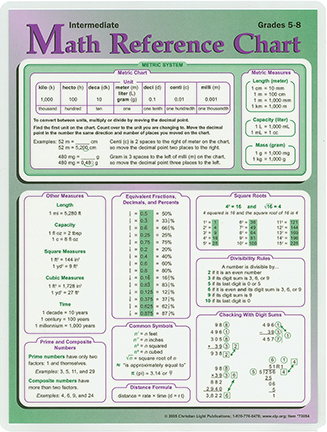 It contains metric measures; equivalent decimals and percents for common fractions; squares and square roots up to 15; divisibility rules; geometry formulas for perimeter, area, and volume; algebra helps; and more. Grades 5-8. Item: S73054 Size: 8 1/2 x 11 Binding: Laminated Publisher: Christian Light Publications, Inc.